What you need to know about the Yealink T42G. Take care of business with conference and 3-way calling capabilities. Make each call count with a four-star phone. Phone tech doesn’t have to be fancy. It’s important to equip your business with the appropriate hardware, and your line of work may not call for the most feature-laden phone. It’s often necessary to stick with the basics, and the Yealink T42G is an entry-level corded voice over IP phone suited for businesses with higher call volumes. With capacity for up to 12 lines, the phone showcases many dynamic features and a simple user interface that streamlines your workflow and increases productivity. From call conferencing to routing and transfers, and for everything in between, the Yealink T42G provides crystal clear communication with your customers. What’s more, it’s one of the most affordable options available. What kind of service pairs best with a Yealink phone? 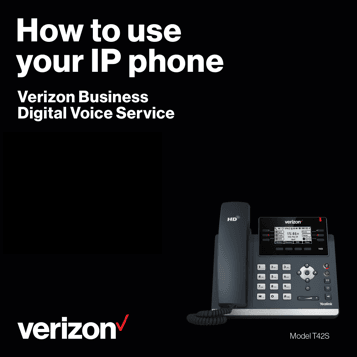 Check out Verizon Business Digital Voice. The Yealink T42G showcases a backlit B&W LCD and 6 line keys that support up to 12 lines. The 12-key dial pad also features home, speaker, mute, headset, volume, messages, hold, and transfer keys. It has Optima HD Voice on speaker, handset, and headset. This flyer provides you with the basic information found in the Yealink T42G manual. Chained to your desk? The right phone can set you free. Phone calls are the backbone of your operations, and so much rests on your ability to answer them quickly and efficiently. In fact, 92% of customer interactions happen over the phone, and approximately 85% of customers whose calls aren’t answered won’t call back. Answer incoming calls on your desk phone, mobile phone, or any phone you choose with the simultaneous ring feature. Direct calls to other team members if you aren’t available so your calls aren’t missed and customers aren’t put on hold. Provide flexibility so you can get more done in your workday. Customer success story: VoIP is my small business survival multi-tool. I run a small business, and I have to think big in order to compete in my industry. I knew having the latest technology would help, but only certain features really applied to my business. I was also worried it might be expensive. How could I justify upgrading to a hosted VoIP system when I wasn’t sure I truly needed it? That thinking changed when I took the plunge and got Verizon Business Digital Voice with Fios business internet. Hosted VoIP was actually much cheaper than I thought it would be. All I had to do was buy the desktop phone, which was less than $100. Once I saw all of the advanced features in action—like being able to forward calls to my cell phone when I’m away from my office, or having voicemails automatically sent to my email account—I was amazed with the impact it had on my business. The quality of the HD voice is by far the clearest audio you could possibly get and having hosted VoIP has freed up so much of my time. What’s more, I only have to activate the features that I need, so I’m not stuck with more than I can handle. Verizon Business Digital Voice has brought stability and peace of mind back to my business. Nowadays, technology and devices go everywhere we do, including business media. Naturally, working on the go or remotely has become the common story, and because of this most have come to expect instant connectivity and access to what they need. This raises the bar for businesses as far as customer service goes. Running a small business is challenging. It’s easy to be overshadowed by bigger businesses in your field, or to blend into the competitive landscape. VoIP changes that—your business can transform from an underdog into a contender and deliver exceptional service to your customers with the advanced features of a Yealink phone. per line, plus taxes, fees & equip. charges with 2-yr. agmt. that auto-renews. Why complicate things? Talk to customers the easy way. Your network makes a difference. You need internet to make a hosted VoIP system work, and our network delivers the fastest speeds and superior reliability to keep your business running smoothly. Bundling brings out the best in your business. Your phone line is the lifeline of your business. Bundling Verizon Fios internet makes it that much stronger, and saves you time and money in the long run. Answer calls from your cell phone with the Business Digital Voice mobile app. You now have the freedom to work anywhere that has an internet connection. Yealink provides phones you can rely on. Don’t keep investing in tech. 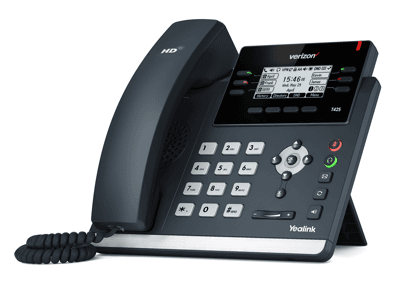 Yealink phones are dependable, have a sturdy design, and are compatible with many of the VoIP industry’s top brands.